Hoi An offers several styles of yoga classes, from the relaxed to Eka Hasta Vrksasana. 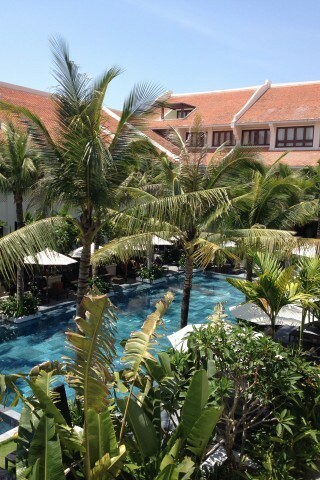 Browse places to stay in Hoi An on Booking.com. Book Now - Pay Only When You Stay. Here’s a round up of what’s available. With the longstanding Hoi An Yoga now closed, Nomad Yoga is currently Hoi An’s go-to studio. They offer Ashtanga, hatha, gentle classes as well as kids’ yoga and meditation. A single drop-in class is 130,000 dong. Check their website for up-to-date pricing and the week’s schedule. The studio is located on Le Hong Phong Street, mid-way between An Bang Beach and town. Wellness and spa-centric resort Almanity allows outside guests to attend their daily morning yoga class from 07:00 to 08:30, enjoyed in the air-conditioned loveliness of their second floor yoga room. The price is part of a “membership” deal that allows you access to their fitness centre, swimming pool and 20 per cent discounts on spa, food and beverage. The price for one day is 175,000 dong, or 950,000 dong for one month. Further afield, there are more options in Da Nang. The Maia Spa at Fusion Suites offers class daily, with hatha, yin and vinyasa on offer at a drop-in rate of 220,000 dong. Book in advance. And for something a little more daring, check out Aro Yoga Danang, which offers both traditional yoga and “air" or anti-gravity yoga, which uses a silk hammock (think Cirque-du-Soleil). We haven’t tried it but we’d love to see what a flying downward dog looks like. Their pricing is geared towards residents of Da Nang who can buy memberships but for those just dropping in, the price is 500,000 dong per session. T: (0511) 352 2200; aroyogadanang@gmail.com; www.facebook.com. Maia Spa at Fusion Suites Da Nang: Vo Nguyen Gap Street, Da Nang; T: (0511) 391 9777; info@fusionsuitesdanangbeach.com; fusionsuitesdanangbeach.com. Nomad Yoga Hoi An: 6 Le Hong Phong, Hoi An; T: (0907) 489 129; nomadyogaom@gmail.com; www.nomadyogahoian.com. Last updated on 14th August, 2016.